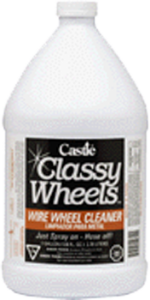 Castle® Classy Wheels™ is an advanced formula foaming wheel cleaner is safe for aluminum, mag, and chrome plated plastic wheels, when used as directed. 1. Wet wheel with water. 2. Apply with applicator or spray bottle. 3. Rub stubborn soil where necessary. 5. Do not allow product to dry on surface. 6. 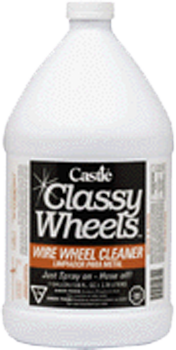 Can be used full strength or diluted to 4oz. per gallon, depending on the job. Store in cool, dry place away from caustic materials. Do not store where a leak could come in contact with metal.